Action Sheds Australia offers the best selection of all types of workshops, garages, storage sheds, and more. We have all the different types of sheds that you may need, and aircraft hangars are some of our most interesting selections. We have an excellent assortment of aircraft hangars for whichever kind of craft you need to house. The best part of our hangar program is that all are completely customisable. This means that height, width, and length are entirely up to the discretion of you, the customer. 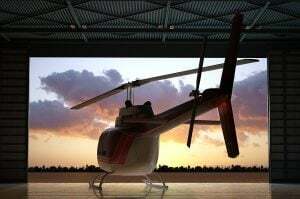 The most basic model is a small hangar, meant to contain a single helicopter. The basicness of this makes it easy for a one bay hangar. From there, you can expand your design in size to accommodate a small plane, personal two seat plane, and beyond. Depending on what dimensions you’d like, you could even construct a hangar for a full size commercial airplane. The possibilities are, for all intents and purposes, limitless! In addition to alternatives in size, we offer a variety of additional features and optional add-ons for all our various sheds and hangars. Most of these deal with designing the inside of the hangar for maximum storage and functional potential. As internal design goes, we can fit the hangar with dividing walls, separating the hangar into parts. This is useful for keeping different crafts separate and creating a double bay. We can also add mezzanine floors to the inside of the hangar, thus separating the hangar into upper and lower areas. This is beneficial because it adds extra storage to the top of the hangar, or leaves places to put offices, either above or below. The sliding door to the hangar is also customisable because its size can be altered to adhere to the size of your aircraft. In addition, we can include remote-controlled motorised doors or outriggers. All of our hangars and sheds are supported by a ten year warranty on structure and a fifteen year cladding warranty. They are also built to the highest national and industrial standards. We deliver our hangars to anywhere in the country and will even assemble them for you on site. If you have any questions about our aircraft hangar options and construction, feel free to call us at 1300 778 628.